It is now ten years since the Columbine High School shooting when 18 year old Eric Harris and 17 year old Dylan Klebold, killed 12 students, a teacher and wounded a further 24 people. This infamous day ended with Harris and Klebold committing suicide before they could be apprehended. Less than a year before the Columbine High School shooting the FBI's National Center for the Analysis of Violent Crime (NCAVC) had initiated a research initiative to study school shootings, from a behavioral perspective. The original research was designed to study specific cases of school shootings or foiled attempts in order to develop a better understanding of these events, the incident itself, and the shooter, his background, the school, and other social dynamics which may have influenced the crime. Eighteen cases were identified and included in the study. 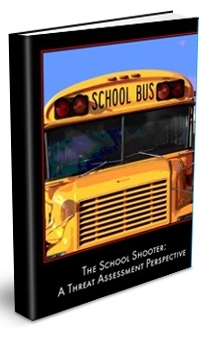 The Columbine shooting hightened this research effort and in response the FBI's National Center for the Analysis of Violent Crime (NCAVC) invited 160 educators, administrators, mental health professionals, law enforcement officers, and prosecutors to a symposium on school shootings and threat assessment. In attendance were teachers and administrators from all eighteen schools involved in the original NCAVC research (including someone from each school who knew the shooter or would-be shooter personally), NCAVC staff members, and law enforcement officers who were involved in investigating each of the shootings. Also attending were experts in disciplines including adolescent violence, mental health, suicidology, school dynamics, and family dynamics. As a result, the following monograph was developed from the concepts and principles developed by the FBI's NCAVC in nearly 25 years of experience in threat assessment, ideas generated at the NCAVC symposium on school shootings, and an in-depth review of eighteen school shooting cases.